To explain Japanese castles, it is inevitable to use old province name where each castle located. Besides, history of each castle deeply relates to the rise and fall of warlords, and individual history is described in each entry but it is difficult to grasp the perspective of this era. 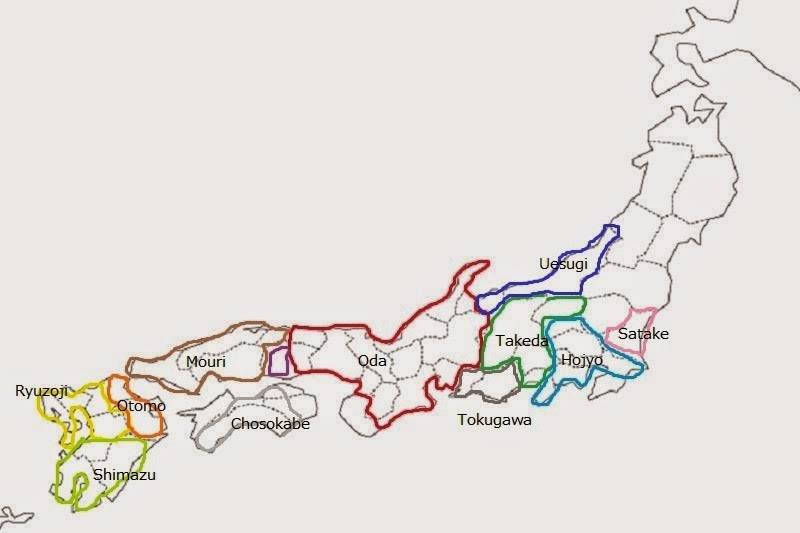 Because of this, brief explanation of old province name corresponding to current prefecture name, and power map of whole nation by each decade between 1540 to 1600 are provided for reference. Japanese old province name is called as "Ryoseikoku". This system was originally decided at Taiho Ritsuryo published in 701, and later modified and fixed by 11th century. 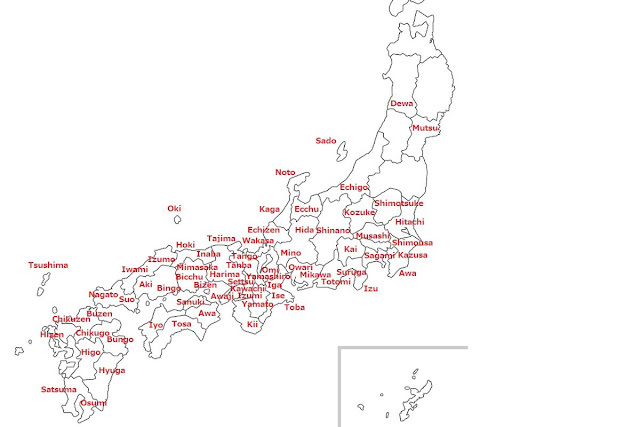 Total number of province was generally said as 66, larger than 48 prefectures of current era. 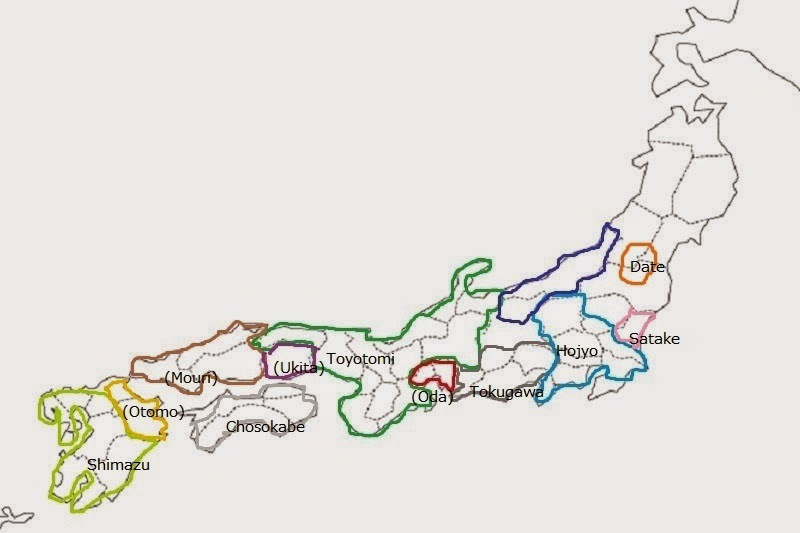 Basically old provinces correspond to current prefecture, but too much split provinces such as Kinki region and Chugoku region region were merged at the time of Meiji Revolution, when current prefecture system was introduced. 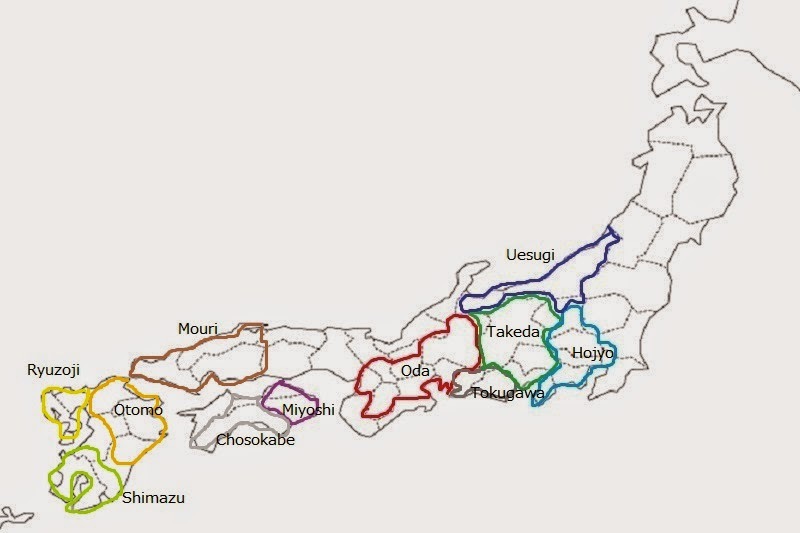 (Kinki provinces were small due to the closeness to the capital Kyoto city. Chugoku region was the place of ancient strong kingdom and it is said to split their territory to weaken these old powers). 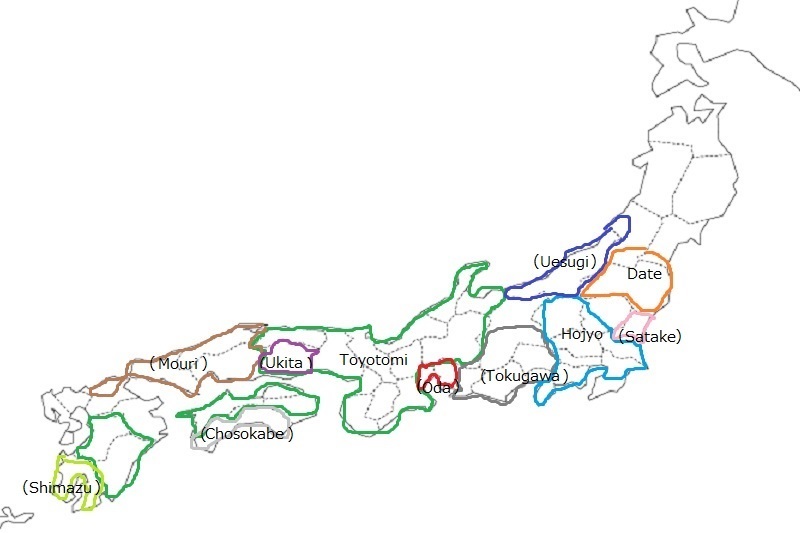 On the other hand, Tohoku region was originally only divided to Mutsu province at Pacific Ocean side and Dewa province at Sea of Japan side. 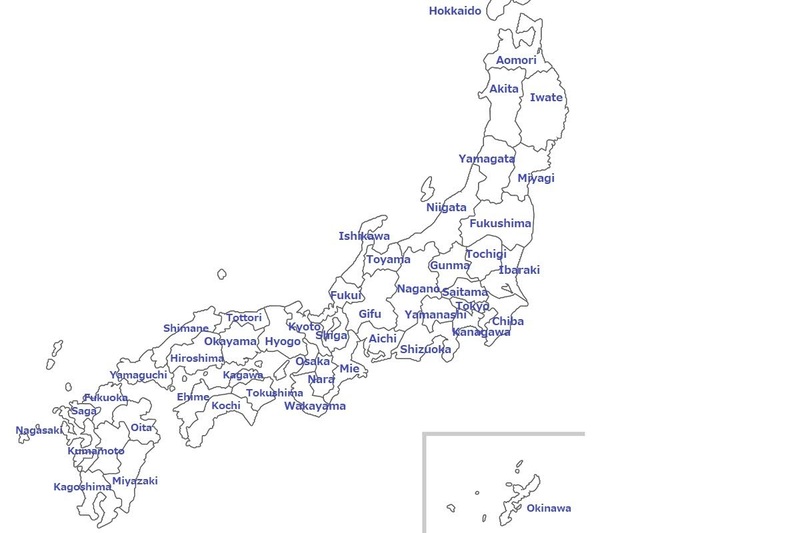 These province was too large and divided into many prefectures later. The origin of warlords was mainly governors or deputy governors of province thus they at first tried to establish their authority at each province with high autonomy. Once they could built strong dominance, next they tried to expand their territory to surrounding nation, fighting or cooperating with neighbor warlords. Among such conflict, rulers such as Nobunaga Oda (1534-1582), Hideyoshi Toyotomi (1537-1598) and Ieyasu Tokugawa (1543-1616) emerged and united the whole nation with military power. Around 1540, there still remains old governors in each province, and the territory of warlords were still limited. Ouchi clan was a house of traditional governor but had a power based on large territory and the profit from foreign trade. 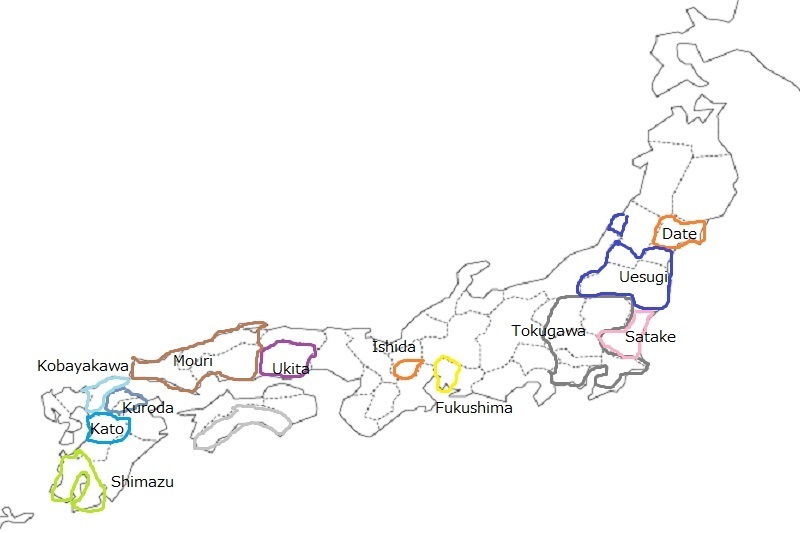 Around 1550, Takeda clan, Imagawa clan and Hojyo clan made a triangle treaty and expanded their territories to next province. Uesugi clan also became strong and fiercely fought against Takeda clan and Hojyo clan. In Kinki region Miyoshi clan grew their power and virtually established their government, and in Kyushu region Otomo clan became dominant. In 1560, Yoshimoto Imagawa was defeated by Nobunaga Oda at the battle of Okehazama, then Ieyasu Tokugawa became an independent warlord and allied with Oda clan. In Chugoku region, Ouchi clan disappeared by a coup d'etat by Harukata Sue, and Motonari Mouri rose to the strong power along with Amago clan. Around 1570, Nobunaga Oda marched to Kyoto city and became the ruler of central area. 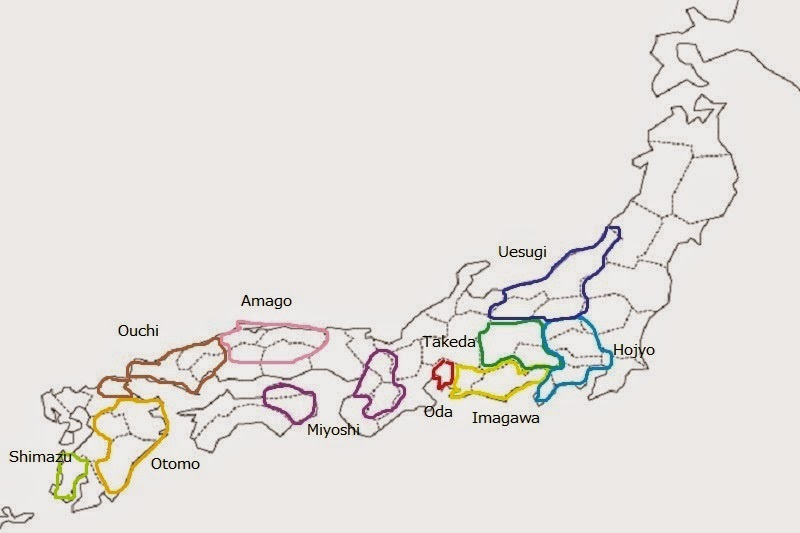 On the other hand, Takeda clan proceeded to former Imagawa territories and became its peak. In Chugoku region, Mouri clan defeated Amago clan and became the ruler of the region. 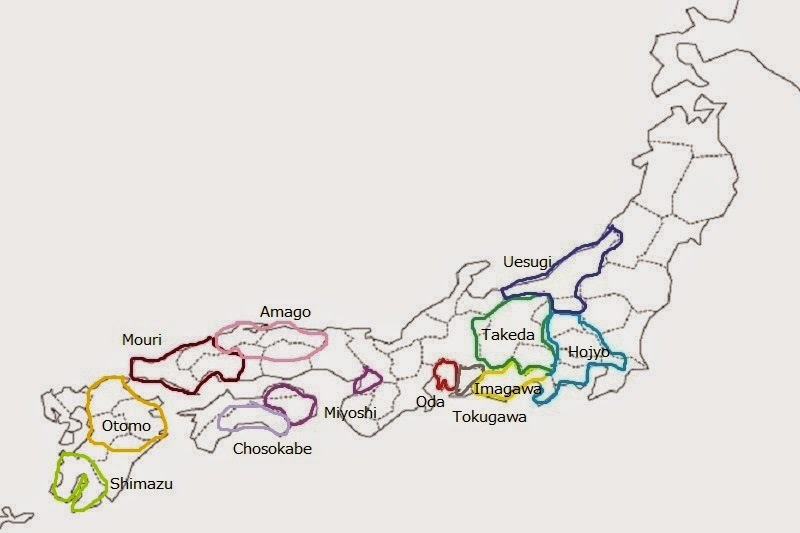 Chosokabe clan started unification of Shikoku island, and in Kyushu island there was a three-way contest of Otomo clan, Ryuzoji clan and Shimazu clan. By 1580, Nobunaga Oda defeated all enemies in Kinki region, and entered total war against Mouri clan. Chosokabe clan grasped most part of Shikoku island, and in Kyushu island Otomo clan lost against Shimazu clan at the battle of Mimikawa and significantly became weakened. Nobunaga Oda extinguished Takeda clan but died at the incident of Honnoji, a coup d'etat by his general Mitsuhide Akechi in 1582, then Hideyoshi Toyotomi won the battle for successor and became the next ruler. Ieyasu Tokugawa expanded into eastward and survived attack from Hideyoshi Toyotomi. Motochika Chosokabe once united Shikoku island but was subjugated by Hideyoshi soon. In Kyushu island Shimazu clan defeated Ryuzoji clan at the battle of Okitanawate and overwhelmed Otomo clan. Chosokabe clan and Shimazu clan was defeated by Hideyoshi and pushed into their original territory. 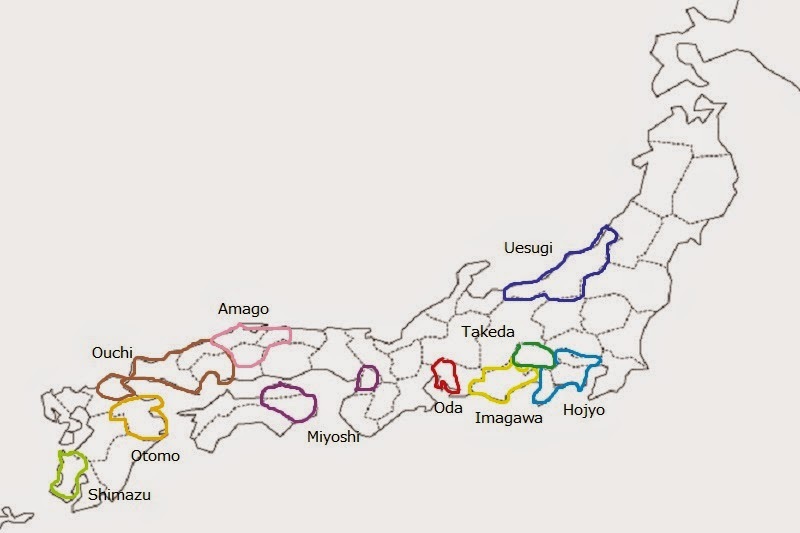 Hojyo clan held most part of Kanto region, and Date clan rapidly expanded their territory at south part of Tohoku region. But Hideyoshi defeated Hojyo clan and let Date clan to yield him, and united Japan in 1590. After the extinction of Hojyo clan, Ieyasu Tokugawa was moved to Kanto region but had the largest territory under Toyotomi government. After the death of Hideyoshi, his chief administrative staff Mitsunari Ishida tried to stop the usurpation of Ieyasu in cooperation with other large lords such as Ukita clan or Uesugi clan, but lost at the battle of Sekigahara and Ieyasu became the final winner of Sengoku era.